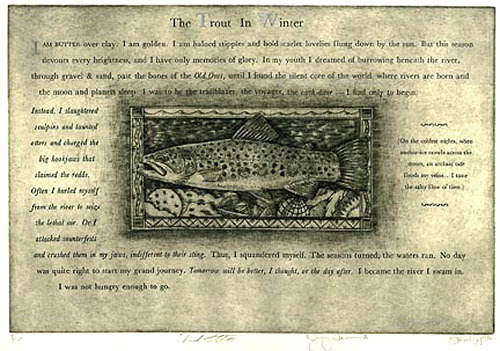 The Broadside The Trout In Winter printed at Deep Wood Press. Chad Pastotnik, founder of Deep Wood Press began this lifes work as a printmaker focussing on the intaglio process's of engraving and mezzotint and the relief process of wood engraving. Book binding started happening in 1990 which led to letterpress shortly after. The cohesion of fine art prints in the hand bound book form accompanied by precision hand-set letterpress printing of various texts is the primary focus of Deep Wood Press. THE LEGEND OF MINISENS, (2002), a collaborative project. Written by Judith Hitz and containing nine original prints, three each by Meredith Krell, Chad Pastotnik and Steve Toornman - wood engravings, intaglio and linoleum cuts. Type set in the font of Baskerville and impressed onto Hannemuhle Biblio paper gathered into a strap binding in three sections. Edition of 30 books, 7 3/4 x 7 1/4 inches, signed and numbered by the writer and artists, 28 pages. Available November 2002. St-Armand paper covers and a additional 50 books quarter bound in boards covered in handmade Richard De Bas floral paper and green cloth spine, numbered and signed by the author and printer. THERE BE MONSTERS, (1998), Short story, wood engraving and a linoleum cut by Chad Pastotnik. Told from the monsters perspective, kind of fun. Hand set in Lutetia with swash characters and printed on Neenah Classic Laid (deluxe) and Classic Laid Writing (reg.) paper. 25 books bound deluxe on straps woven into Iowa PC4 paper and 150 books pamphlet bound into Gray Flax Canal paper. Hand colored wood engraving and linoleum cut, 10 pgs. 5 1/4 x 5 inches. $50.00 and $35.00 Numbered and signed deluxe only.